What Is Martin Shkreli's Net Worth (and How Much Will It Shrink Post-Arrest)? Subject: What Is Martin Shkreli's Net Worth (and How Much Will It Shrink Post-Arrest)? The infamous young CEO of Turing Pharmaceuticals, Martin Shkreli, was arrested last Thursday for securities fraud. He stands accused of using money from another drug company he ran, Retrophin, to pay off debts owed by his failed hedge fund, MSMB Capital Management. Shkreli orchestrated a "web of lies and deceit," U.S. Attorney Robert Capers said in a press conference on Dec. 17. "His plots were matched only by efforts to conceal the fraud, which led him to operate his companies, including a publicly traded company, as a Ponzi scheme, where he used the assets of the new entity to pay off debts from the old entity." The 32-year-old has since posted $5 million in bail money. The Brooklyn-born entrepreneur has an estimated net worth of $100 million, according to Heavy.com on Dec. 17. 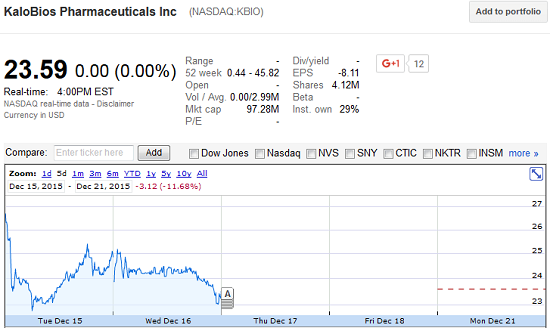 Shkreli was named as CEO of KaloBios Pharmaceuticals Inc. (Nasdaq: KBIO) on Nov. 20 after buying 2,075,200 common shares in the company. Word of his arrest caused share value to drop quickly. That's a $26.7 million loss for Shkreli's stake. 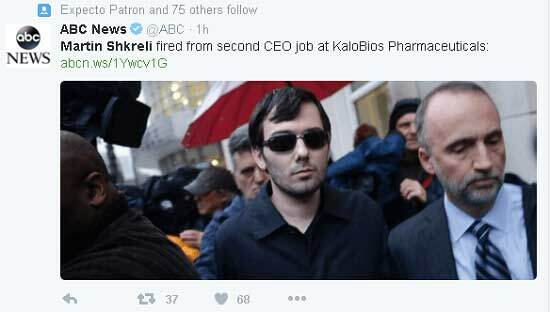 Today, KaloBios Pharmaceuticals announced that Shkreli was out as chief executive. He voluntarily resigned from the company's board. In addition to losing his job and being arrested, Shkreli is also being sued by his former company Retrophin. The pharmaceutical company filed a federal suit against Shkreli on April 13, alleging that he created the biotech and took it public solely to provide stock to MSMB investors when the hedge fund became insolvent, reported Forbes on April 18. The suit seeks more than $65 million in damages and requires that Shkreli turn over all the compensation he received during the time he acted as a "faithless servant" to it, as the claim read. This pending lawsuit cost for the young "pharma bro," combined with the $26.7 million he saw vanish following his arrest, totals a loss of $91.7 million. That's 91.7% of Shkreli's total net worth. Ouch. Let's not forget to tack on the $2 million he spent on that Wu Tang Clan album back in March 2014. Make that 93.7%, then. Read more about Martin Shkreli's net worth, plus the latest on his trials and tribulations by following us on Twitter @moneymorning or by liking us on Facebook.